Sometimes I wonder how my family fits it all in. Life with a teen and tween is busier than I ever imagined which makes me appreciate our time together traveling even more. It’s time to explore new places and relax, instead of finishing homework and racing off to swim practice. We’ve been incredibly fortunate to visit some fabulous places this year. And along with great destinations came equally impressive family-friendly hotels and resorts. Narrowing down the best of the bunch wasn’t easy, but if you can find the time, I’ve got five you should fit into your family’s 2012 travel schedule. You won’t be disappointed! And, by the way, I’m listing them in order of my family’s stay, not in order of preference. Complete with a 24 hour chocolate milk bar, Laguna Lodge was our home away from home during our family vacation in the Jungle of Costa Rica. Tortuguero, Costa Rica, population 1200, is in the middle of nowhere. It has a small airport, but most visitors opt for the two hour boat ride. Laguna Lodge offers clean, comfortable, rustic rooms in an incredible jungle setting. My girls don’t especially enjoy sleeping together when we travel, so the fact our room had three beds, a queen and two twins, meant a better night’s sleep for all! If the crocodiles, sloths, birds and monkeys don’t keep you busy, Laguna Lodge will. Kids of all ages can run on the soccer field or volleyball court, or head straight to the family pool. Adults looking for peace and quiet can stake out a spot at the adult only pool. Our stay in Guanacaste was perfect end to a 10 day Costa Rica adventure. Designed to be the actual “vacation” part of the trip, it was just what the family needed. 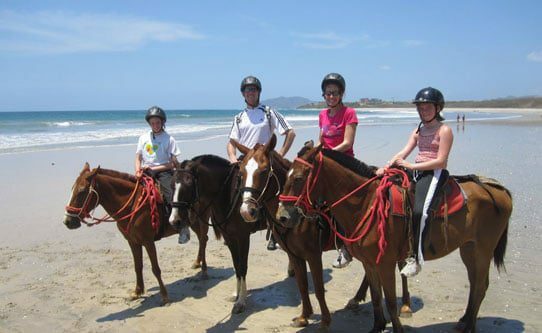 The JW Marriott Guanacaste Resort & Spa is an immense property where you can do just about anything. My recommendations; take the family horseback riding on the beach, zipling or hunt for a turtle nest in the tropical bird and wildlife sanctuary. The kids swam miles in the resort’s infinity pool. It’s the largest in Central America. With them so well entertained, I took a two-hour walk on the beach … and after leaving the resort boundaries never saw another soul. It was just me and all the shells I could carry. Pure bliss! You can’t not have fun at the Hyatt Regency Huntington Beach. It’s impossible. If the scenic stretch of the Pacific Ocean just out the back door wasn’t enough, Slyders water playground will make your kids think you’re a star for finding the perfect vacation spot. The water playground has three mellow but fun water slides, an enormous 25-person hot tub, a wading pool for little ones, and a large family pool. The Hyatt Regency Huntington Beach poolside café has great kid-friendly options, if you can get the kids out of the water. Surf lessons, Dig It! sand castle building school and kite flying lessons will easily fill the rest of your day. When the sun goes down, try keeping everyone awake for s’mores and a dive-in movie. Every now and then I get to sneak away without the kids. On a trip to Vancouver with a college friend I fell in love with the Fairmont Pacific Rim. Less than a couple years old, it’s a newcomer making its mark on the Vancouver hotel scene. Designed with five star standards and amenities, it’s sophisticated and comfortable at the same time. With stunning harbor and mountain views from just about every angle, the location can’t be beat. In the heart of the Vancouver, a quick walk will take you to popular Vancouver attractions like Stanley Park, the Vancouver Aquarium and the Gastown area. The fact that I didn’t have the family with me is my excuse to go back sooner as opposed to later. Want to do something unique with your kids? How about a visit to a 500 acre playground? Carmel Valley Ranch loves kids and kids at heart. Their “playlist” of activities includes suiting up and learning the ins and outs of bee keeping, distilling lavender, and hiking with the deer and wild turkeys who are lucky enough to call Carmel Valley Ranch home. The River Ranch Complex has a small playground, Junior Olympic Pool, an oversized hot tub, soaking fountains, bocce ball, basketball and tennis courts. Whew! Whatever you do, don’t leave without swinging on one of the resort’s iconic tree swings. When’s the last time you were on a swing? Too long I bet. So many choices to little time. Get out the family calendar and make reservations. Don’t let homework, school fundraisers and track meets steal all your weekends.